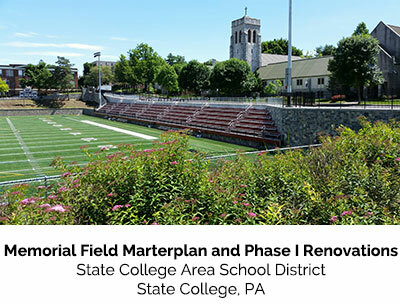 The design team of The Palumbo Group, Skibinski Associates and Crawford Architects (aka Palumbo Skibinski Crawford) was commissioned by the State College Area School District (SCASD) to develop a schematic design for the renovation and expansion of Memorial Field, originally constructed from 1933-1937. The facility is located in close proximity to the downtown business district and serves as the primary outdoor athletic venue for the SCASD. It hosts several athletic teams, physical education classes and many community organization events. Palumbo Skibinski Crawford conducted design charrettes with the local community and met with the District’s various sports’ coaches and student athletes to program the space. The design team developed design options ranging from approximately 4,000 seats to 5,800 seats, and associated cost estimates. The final plan incorporates new bleachers for approximately 4,000 spectators, rest rooms, locker facilities, concession areas, an internal pedestrian access walkway, ticket booths, a plaza area, storm water management facilities and other amenities. Estimated project cost totaled $16.0 million. Palumbo Skibinski Crawford was subsequently retained to develop contract documents and to provide construction administration services for Phase 1 of the schematic design/ renovation plan. This $2.8 million project was completed in 2014.